Having said all of that, I went up to the cabin this weekend for the first time since the fire and since the snow has melted in the mountains. For those of you familiar with the area I drove from Highway 80 in Auburn >Highway 49> through Georgetown and up Wentworth Springs Road towards Ice House. 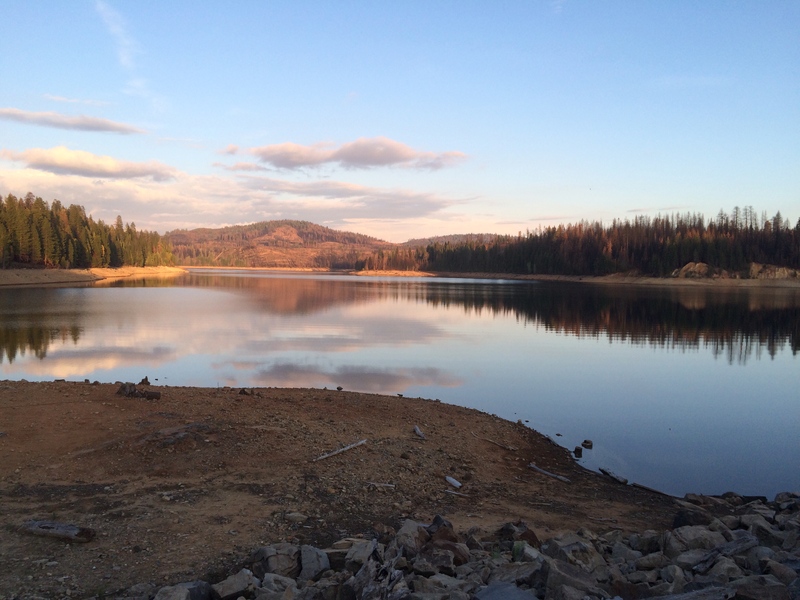 I was extremely saddened to see Stumpy Meadows reservoir almost entirely burned. And the beautiful tree lined road for tens of miles at a time burned and destroyed and clear cut. It was easy for me to pretend that it was fall and the orange needles on the pine trees were just turning colors in October. But, the reality is needles don’t turn orange and all of those trees are dead. Logging has begun with hundreds of logging trucks making the drive on a daily basis. I can only hope planting will begin soon. But as my husband put it, “The forest will never look like it is supposed to again in our lifetime.” That thought weighs heavily on my mind. 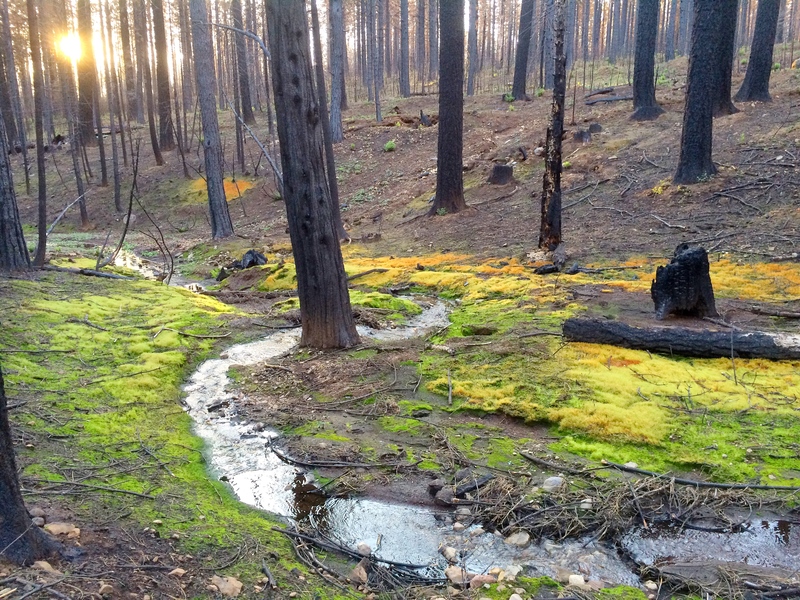 Rainbow colored moss growing near a stream and under a burned tree. 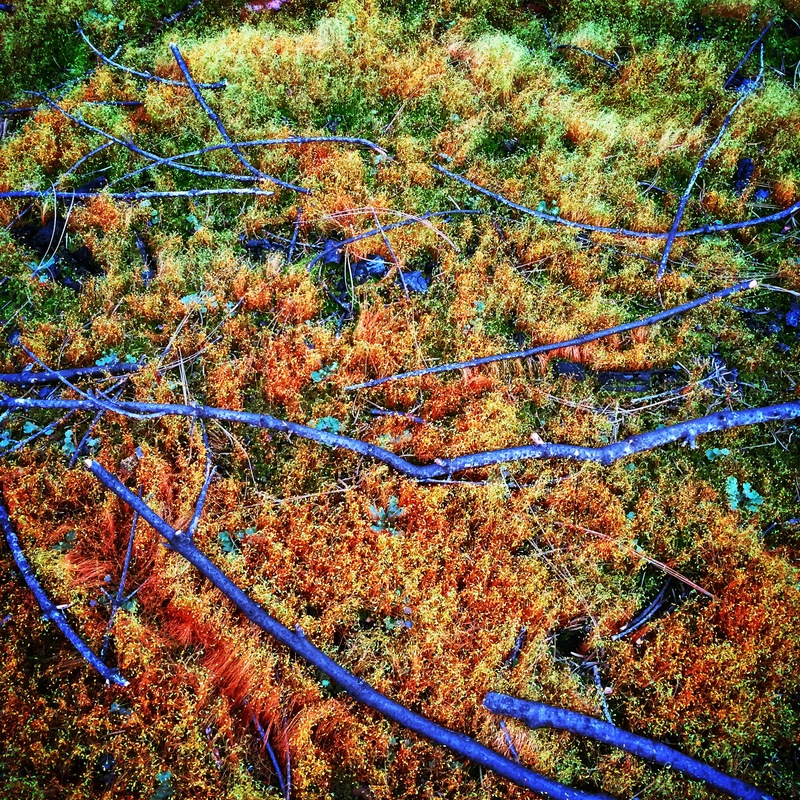 I have never seen moss this color in this forest before. 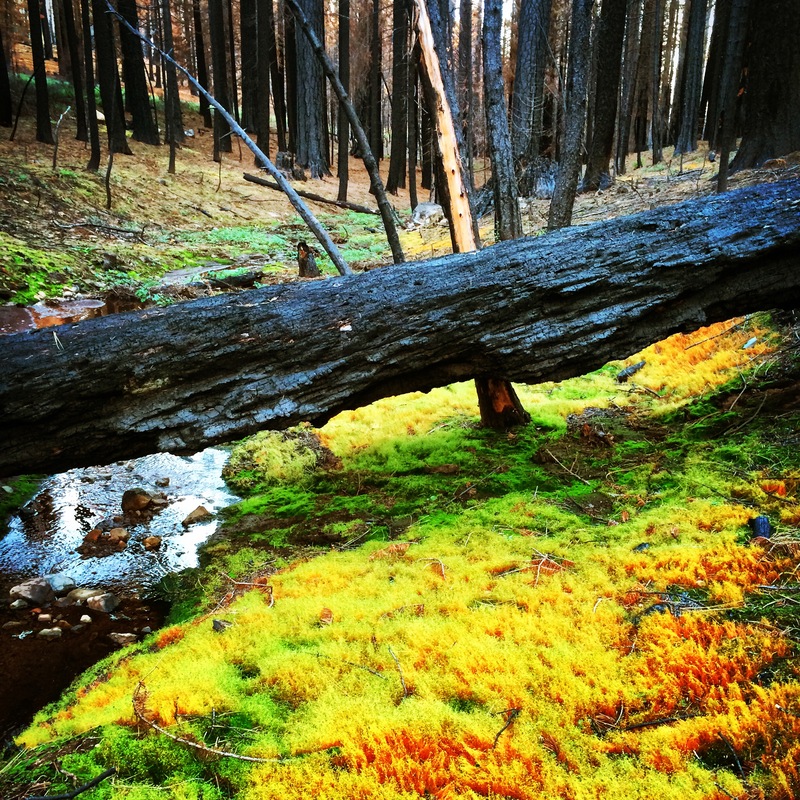 More beautiful moss growing near burned out trees. Strange things growing on the forest floor. This photo almost looks like it belongs in an aquarium not on the forest floor. 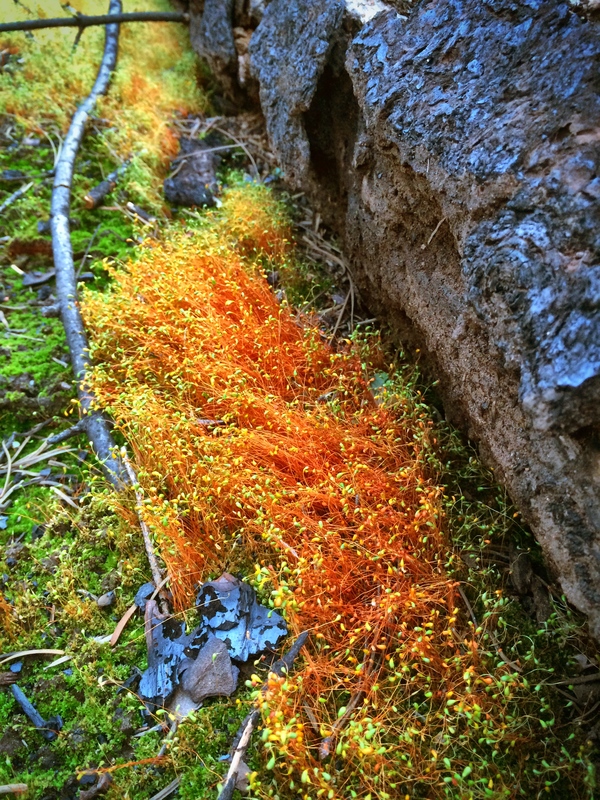 Gorgeous colored moss growing near a stream. It looks to me like it can be an abstract painting. 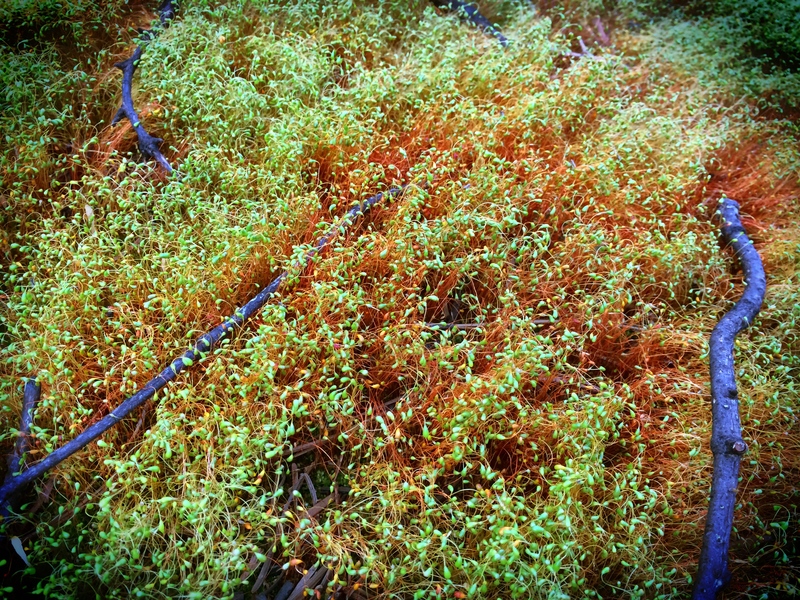 Gorgeous colored grasses and moss growing near a burned out tree trunk. Massive burn piles are being created by the loggers. Had to put the Jeep in the photo so you could see how large these burn piles are in spots. 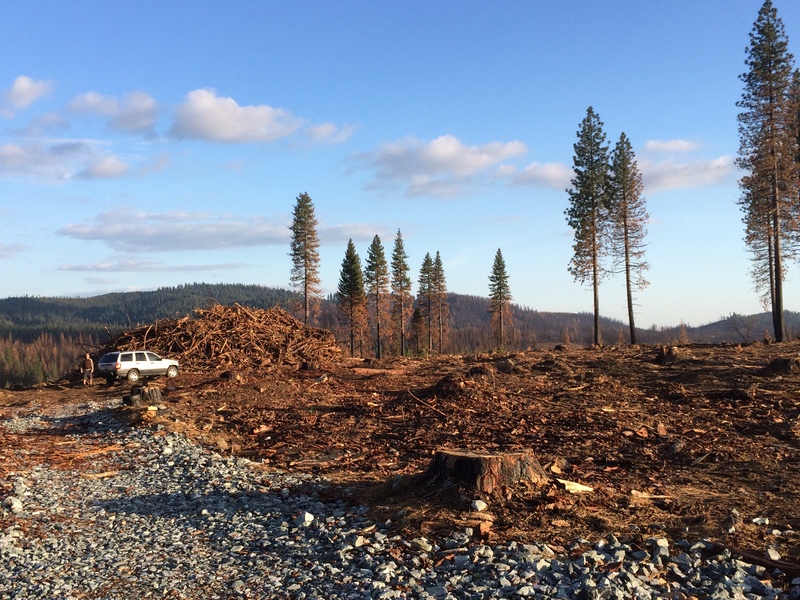 I understand that hundreds of logging trucks are going through here each day. I can’t wait to see baby trees being planted. Stumpy Meadows is a pretty reservoir. 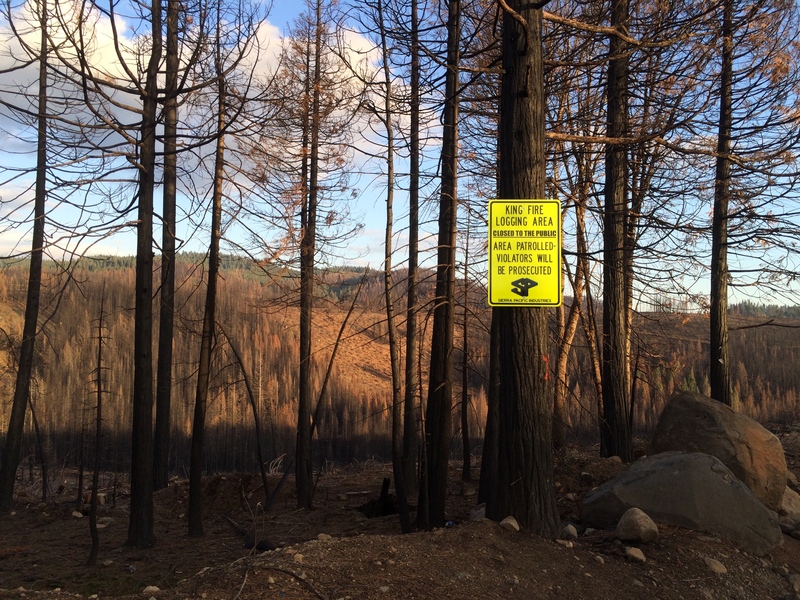 This was the scene of one of the more dramatic videos during the King Fire. The majority of the reservoir was on fire. If you look closely you can see the trees have been burned almost all the way around the photo. It is still beautiful in this light but it is mostly destroyed. It makes me wonder what it will look like after it is logged and barren. Thank you. It was really interesting for sure. It is a great place to be with my family. Thankfully the forest directly around our cabin was spared. You have a great spirit – to be able to find the hope and the beauty in a place that you knew in a totally different way. That moss is fabulous! And the blue fungus stuff looks like bare blue feet! 🙂 It’s great that you showed this post because so many people do not come back to the scene after a fire, and do not get the chance to watch the forest begin again. Even though you used your phone, the pictures are wonderful. Thank you. I found it really fascinating. And I am so glad I stopped to take a closer look. It cheered me up after seeing it all on the drive up. I certainly wasn’t expecting to find all that! Thanks for the comment! Thank you! Thanks for the comment and for visiting my blog. I hope to see you again. Delighted to have you participate in the weekly mobile photography challenge. Your images capture the sweeping beauty and some destruction by Mother Nature’s hand. Glad to hear that your family cabin survived the ordeal. I’ve been witness to this devastation during a visit to Yosemite, which is a pristine site of grandeur–a place that encourages a true sense of one’s inner spirituality. If you return to my latest post, you can read the guidelines for the challenge (under the Note section). Participants send me a comment (as you did) to notify me or a Pingback. Then I list your post on mine. Happy to have you join the fun. Thank you for the note. I imagine Yosemite is going through the exact same thing since the fire they had there was also so large and devastating. Thank you so much for letting me be a part of your challenge. I look forward to participating in ones in the future. I’m happy to have you join us. 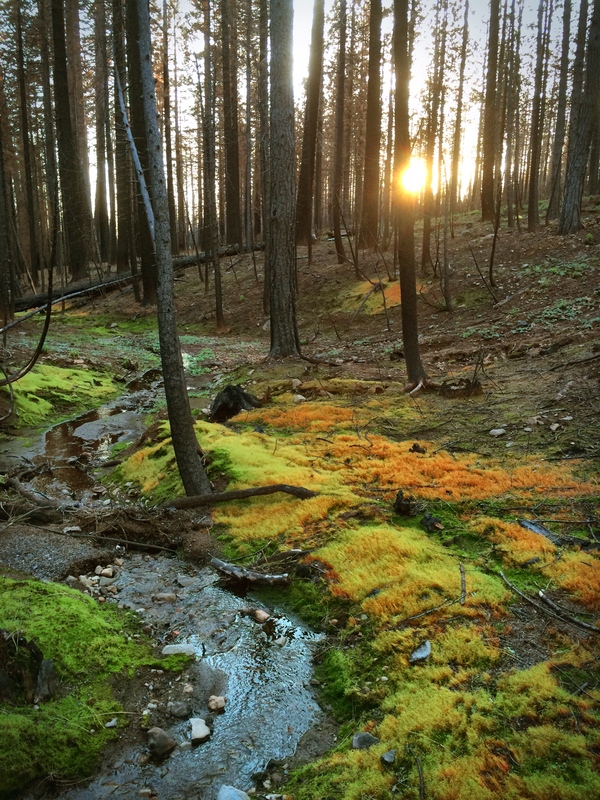 Beautiful captivating special pictures from after the burn from that forest! 🙂 Waw even! Thanks! It was a fascinating moment for me for sure. 🙂 I bet! Have a nice evening! Thank you! Very kind of you. I wish I knew what those clover shaped mysteries were myself. Lots of people have been asking me. I suppose it is some sort of fungi. I am hoping to show them to a family friend who is a botanist so perhaps she can shed some light. They look to me like they belong in an aquarium. Interesting post! Your picture shows how nature repairs itself. 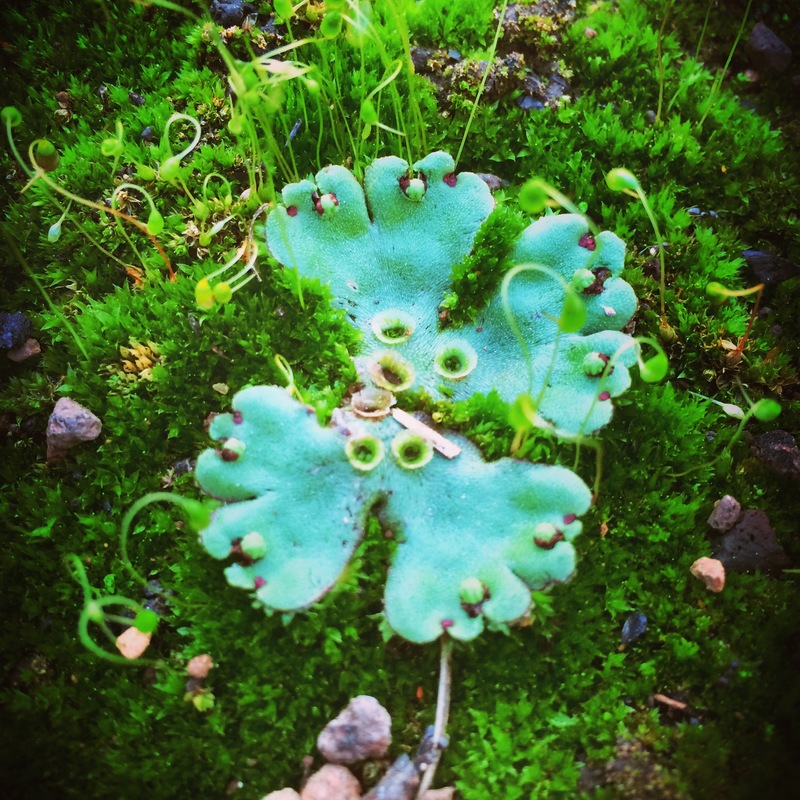 Could you find out what these strange plants are? I wish I could. I haven’t found anyone that could help me yet. Hoping to talk to a biologist up there one of these days. Thank you! I only wish I had my Nikon with me instead of my iPhone but hey it did the job! Thanks for the comment. Some impressive captures with your iPhone. I never would have guessed. Thanks! You can really tell when you enlarge them or print them but I am happy enough with them! The third moss really looks like an alien and what were those blue stick things in the photo that follows? Great post! They were just twigs laying on the ground. The light made them look kind of blue. Thanks for the comment. These are some of my favorite photos.